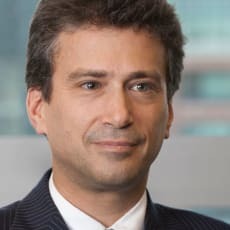 Christopher Kandel is co-chair of Latham & Watkin’s global banking practice group and specialises in complex international acquisition and leveraged finance transactions. He is distinguished in the London market as one of the few lawyers with partner-level experience and expertise in handling leveraged finance and restructuring matters under both English and US law, and is recognised as a leading lawyer in legal directories including Chambers UK (2016 edition tier 1 individual ranking), the Legal 500 (2016 edition ‘Leading Individual’ ranking) and IFLR 1000 (2016 edition ‘Leading Lawyer’ ranking), and by inclusion in Euromoney’s Guide to the World’s Leading Banking Lawyers, Who’s Who in the World (Marquis) and Who’s Who in America (Marquis). During Mr Kandel’s career, he has advised on many landmarks, including numerous European acquisition financings including the largest European LBO financings of the past year (Pirelli), the first super senior revolving facility agreement in Europe, the first pari passu senior secured bank facility/senior secured notes issue in Europe, the largest LBO financing in Asia, the largest high yield in Asia and the first western-sponsor style leveraged buyout financing in Russia.